When companies raise money for expansion and other projects, they must pay for the use of these funds. If the company raises money from shareholders or receives a sum of cash from private investors, this is considered equity. Raising money by borrowing from a bank or issuing bonds qualifies as debt. Each of these methods has its own cost, which can be stated in terms of an interest rate. A company's weighted average cost of capital (WACC) is the average interest rate it must pay to finance its assets, growth and working capital. The WACC is also the minimum average rate of return it must earn on its current assets to satisfy its shareholders or owners, its investors, and its creditors. The WACC is based on a company's capital structure and is composed of both debt financing and equity financing. Cost of capital is a more general concept concerning the amount a firm pays to finance its operations without being specific about the composition of its capital structure (debt and equity). Some small business firms only use debt financing for their operations. Other small startups only use equity financing, particularly if they are funded by equity investors such as venture capitalists. As these small firms grow, it is likely that they will use a combination of debt and equity financing. Debt and equity make up the capital structure of the firm, along with other accounts on the right-hand side of the firm's balance sheet such as preferred stock. As companies grow, they may get financing from debt sources, common equity (retained earnings or new common stock) sources, and even preferred stock sources. To calculate a simplified cost of capital for the firm, first review the firm's current capital structure and calculate its proportion of debt and equity. Then weight the cost of debt and the cost of equity by the resulting percentages when calculating the cost of capital. Next, sum the weighted costs of capital and debt to get the WACC. The cost of debt for a business firm is usually cheaper than the cost of equity capital. This is because the interest expense on debt is tax-deductible for the business firm. This is why many small business firms unless they have investors, use debt financing. The smallest of businesses may use short-term debt only to purchase their assets. For example, they may use supplier credit in the form of accounts payable. They could also just use short-term business loans, either from a bank or some alternative source of financing. Larger businesses may use intermediate or long-term business loans or may even issue bonds to raise money for financing. For example, XYZ, Inc. uses mostly short-term debt in its operations through a line of credit at its bank. The line of credit has a variable interest rate based on market conditions but the average interest rate over the past year has been 9.0 percent. The company made a profit of approximately $20 million last year. Taking a look at the corporate tax tables, use a marginal tax rate of 35 percent. XYZ's cost of debt capital is 5.85 percent. There are usually no underwriting or flotation costs associated with debt financing for a company. The cost of equity capital can be a little more complex in its calculation than the cost of debt capital. It is possible that the firm could use both common stock and preferred stock to raise money for its operations. Most firms do not use preferred stock. This illustration considers the cost of common stock only. Most new equity capital that comes to businesses is raised by reinvesting retained earnings. Even retained earnings have a cost, called an opportunity cost. These earnings could have been used in some other way. For example, they could have been paid out as dividends to shareholders. Estimate the economy's risk-free rate.The risk-free rate is usually the rate of return on U.S. Treasury bills. Estimate the stock market's current rate of return.You can usually look at a broad stock market index, like the Wilshire 5000 and use the rate of return of that index as a proxy for the market rate of return. Estimate the risk of the stock of the company as compared to the market. This measure is called beta.The beta (risk) of the market is specified as 1.0. If the company's risk is greater than the market, its beta is greater than 1.0 and vice versa. You can use historical stock price information to measure beta. You can adjust the historical beta for fundamental factors specific to the company. Often, it is a judgment call on the part of company management. 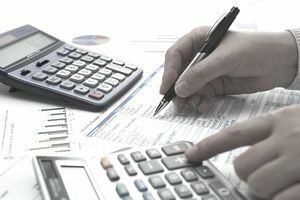 After you have calculated the cost of capital for all the sources of debt and equity that you use, then it is time to calculate the WACC for your company. You weight the capital structure using the percentage for each source of debt and equity capital. If your company uses debt and equity financing in the way suggested above, the company's WACC will be 6.175 percent. If you add other sources of financing, you will need to add their component costs, such as that for new equity or preferred stock. This is a general calculation of the WACC using only the usual measures of debt and equity financing. The formula of WACC can be extended to include other sources of financing as stated above.